Making an employee quit is way more difficult than hiring an employee. It takes a lot of effort by the senior employees or the boss of the team to train an employee. And once when they find the employee is no more needed or he/she under-performs, naturally the pressure builds to take decision to whether have them in the team or make them quit. Most of the cases, managers try to keep them as much as they can but when dragging it too long, it brings negative vibes in the team to stop doing their best and rather feel to relax like the underperforming employee. In order to avoid such kind of resentments among the employees, managers take quick tough steps to make the employees quit on their own. Read this post fully to know how to make an employee quit on their own. How to Get Rid of Toxic Employees? Whenever you come across an underperforming employee in your team or organization, the best way to deal with them is confronting. But not many managers do so, instead take it lightly. Doing so will surely displeasure the performing employees and that can trigger conflicts within the team, which is even worse. Now, why don’t every manager deal with such employees? Most of them leave it thinking that they will improve with time or thinking about their past performance. Another best way to handle such employees is to motivate them to improve themselves. But after all these, you don’t find any changes in the employee, then getting rid of them is the only option left. Usually, no managers would like to take such a step, but there would be some employees who with their behaviour trigger the employers to take such hard decisions. It also helps to manage the team better and also improve their productivity. This is one easy way to put pressure on the employee to make them quit. Assign as many projects as possible with very less time limit. This will indirectly create pressure on them and make them feel like quitting. Working 20 hours a day will not be anyone’s choice to continue in the same office. There are innumerable benefits every employee gets as a reward as a bonus for their over time, special project bonus etc. Do not allot special pay’s for their extra work. Use this opportunity to make them feel they have been working as a slave so that they quit the job on their own. Visiting their desk 10 times a day will surely make them feel frustrated. Keep an eye on the employee about what they do in public so that they feel irritated to work any more. This policy might look like a micromanagement, and no one wants to survive in such a kind of environment where they are watched for their every single step. Try holding a maximum number of meetings with the employee whom you want to make them quit. This will make them distract from doing work as well make them feel they are been given a lot of instructions on how to proceed in the project. Anyone will want to work in a peaceful environment rather than being supervised like a school kid. None of the employees will like to see their managers giving special attentions to other co-workers. Even though you do not have such a habit of having favourites in your team try showing them in front you have many special ones in the office in them. This will make them feel unnoticed which might result in quitting their job on their own. Allot some of the least important projects to them. This will make them feel unimportant as well as lose their role in the over all output of the team. Once they feel that they no more are important, they are likely to quit their job. Allocate an employee the same projects as they do and train them on those projects. This will make the employee understand about the scenario that no more they are needed in the team. Hitting their ego is one way to make them quit their job on their own. One easy method to make the employee quit is using office policies. There are mandate rules every organization has on its own. Most of the rules laid are not followed at all times. So, in order to restrict an employee and make them quit, you can ask them directly to follow these rules avoiding other employees behaviour. This way the employee might feel to quit their job. Any manager or team lead is expected to be very friendly and supportive. Once when you start moving away from them it is natural that they feel insecured. Use this method to make the employee keep in distance. Try avoiding personal calls or do not be available at all times. Minimize your touch with the employee. This might make them feel left out and also give them a thought of quitting their job. One of the most common habits among employees is to hang in social media accounts in their free time or office hours. Even though only a few organizations have restricted them, it can be used as a weapon to make the employee quit their job. Restrict the employee to avoid using social media at free hours. Make them feel tightened at their desk to make them quit. Too many expectations are always a burden for employees. That too when they are expected to give their 100% in their unfamiliar areas will surely burden them to out perform in other areas. Try putting pressure on unfamiliar areas so that they feel the pressure on all they do. This is one tough way to make employees quit their job. Every team in an organization will have some procedure of having group emails or team meetings held often. One simple way to make an employee quit is to ignore them group emails or can be left out from team meetings. This will bring an insecured feel and will make them quit. Every quarterly or half yearly the team would have performance analysis or yearly promotional review meetings. You can directly put a word that there is no chance of promoting or hike at the moment. There is no rule on reducing the pay scale. You can also take a step to de-promote or reduce the pay to make them quit the job on their own. In general, no employee would like to receive negative feedback in public or indirect comments in front of the team. One of the easy things which a manager could do to make them quit is to give them indirect comments or negative feedback in front of the team. Another easy method of asking an employee to quit is by making them do open presentations in front of the team. That too in front of junior level employees this would be a real tough game to survive in the same office. Try often to show that you do not trust them anymore by giving them less importance in the team. Allot fewer projects or make them do nothing will make feel like quitting the job. Even though this is going to be tough, underperformers have to leave at some point of time. You might have a few more weak employees or freshers in the team. You might be sure they will perform one day, so you can use them to show that you trust them more than the under-performer. By this, you motivate a person as well as make an employee learn a lesson to not take things very lethargic. Managers or a team lead have rights to implement many rules on working hours of the team when needed. Using this, a manager can also restrict an employee by making them stay for long working hours. Restrictions can also be made on breaks taken during the working hours. This will create pressure on their freedom in office which will result in quitting the job. For some time it is better to avoid having fun team outings. This will also create tension and no interest to continue in the office. This will create stress on the entire team, but it has to be done to do some good for the team. Unless and until they do not quit on their own, you can use a strategy of approaching human resource department to talk on behalf of you or also you can ask them to do a review analysis of their performance. Though directly asking them to leave is not an ethical way but if you have strong reasons against that particular employee, then you have no other option left. There are few managers who try to hint their employees by few signs, this can be asking them to quit in an indirect way. Take the side of a friend as he is a good company to him. Getting a good employee or a team member is not so easy. But, even a single unworthy employee will affect the entire team. More than the underperformer, managers are put under pressure to react and take a step against them. Even though few methods are not a moral way, there is no other go to do good for the entire team. 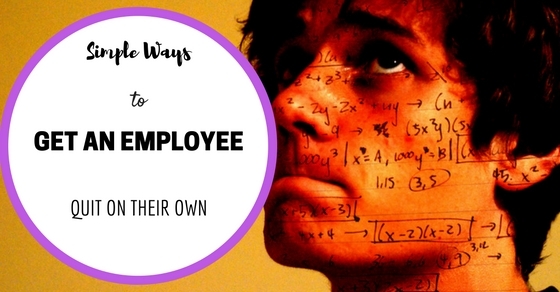 Hope this post helps you to understand many ways of making an employee quit a job on their own.